The content is still current, but the teleclass mentioned below has passed. For a limited time, register here to have a recording of the call sent to you. I’ve been asked many questions of late about silent auction handheld mobile bidding devices. So many questions, I’m hosting a free mobile bidding teleclass (“Best Practices in Mobile Bidding for your Nonprofit Silent Auctions”) next Wednesday (May 2, 2012) to share best practices learned on the front lines while using the technology. In preparation for that call, I want to clarify the terms. Some people refer to e-bidding (electronic bidding) and mobile bidding (mobile bidding is also called handheld bidding) as the same thing. They are different. Electronic bidding may or may not be mobile, but mobile bidding is always electronic. 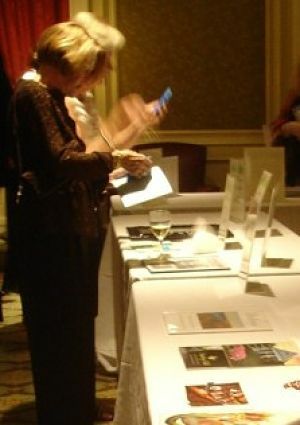 With any sort of e-bidding, guests bid on silent auction items using a device. For the latter, I’ve seen two options. Option 1 is one stationary kiosk per several silent auction items. A kiosk (also called a bidding terminal) could be an iPad or a touch-screen computer. Maybe there is a kiosk for every 5 to 10 items. Option 2 is one stationary kiosk per silent auction item. It’s a one-to-one ratio. One kiosk in front of each silent auction item. If you’re ready to embrace e-bidding — and I’ll mention this on the call, too — I advocate making the technology mobile, unless you’re prepared to adopt Option 2 and set-up one kiosk for EACH silent auction item. Otherwise I don’t think e-bidding is worth it. But it’s certainly better to have a one-to-one ratio than to have only one kiosk per – say – 5 silent auction items. That doesn’t make sense to me at all. Think about it … guests would potentially have to queue up in front of a terminal to place a bid on an item a few feet away! That’s not progress. That’s not user friendly. It might be electronic, but it’s not useful. So are you ready to apply what I’ve been learning as I work with clients on these technologies? Join me on the “Best Practices in Mobile Bidding for your Nonprofit Silent Auctions” teleclass. Just wanted to alert you to the disaster we had last year with IML’s hand-held bidding. The company was great to work with and they were excited to get an event in NW Oregon. However, after I personally secured all the underwriting for the service it didn’t work at the event. We tested it at 4:30pm and everything was great. The 1st round of bids for the SA went through but at 6pm it was a disaster and it never worked again. Thanks to preplanning on our part we had bid sheets ready and our parents jumped up and we had them all out and ready to open again. I was devasted. I worked so hard to get our school to do this and be the “1st auction” in the area and it bombed. The company reps at the event were so embaressed and they did everything they could. We did ask the President of the Co. to write a letter so we could put it in our newsletter and they never did. After our original call the Monday after the event, we’ve never heard anything more from them. I used your webinar to find them, researched their references but their follow up was awful. This is are largest fundraiser of the year. The good news was with our parents effort and a shorter time to bid using the “old-fashioned” bid sheets we made more on the SA than we ever had before. When the service worked the guests loved it. But if a school is going to use it for the 1st time I’d suggest alot more testing up front and time for your guests to see a unit and play with it a week before the event. We had lots of volunteers to help people bid but it just didn’t seem to be enough. FYI, this is my last year at O’Hara Catholic School in Eugene, Oregon. My son will go to high school next year. Good news is he’s going to Marist Catholic High School and our Dev. Dir who I’ve worked with the last 8 years just started at the High School today. So glad to get to work with her for another 4 years! Lou Ann, thank you for sharing this. As I read through your account, I couldn’t help but be impressed by how you managed this upset. We all know how quickly auctions move … from the time the doors open and guests arrive to when check-out opens, time becomes a blur. And yet during that fast-moving period, you tackled a stressful situation head-on, managed to convert to a manual process, and made MORE money?! Some of my onsite clients have used wireless technology and – like yourself – not all rides have been smooth. Sometimes being an early adopter of technology means you are the one everyone else learns from. When the system works, it’s great. And when it doesn’t – pardon the expression – all hell breaks loose. I’m glad to see your frustration hasn’t dampened your auction spirit and that you’ll be helping with the Marist Catholic HS event. The school will be lucky to have you! I applaud your willingness to use technology in your auction and am very sorry that it did not work out in your case. I have a lot of confidence that technology can work and is the future for silent auctions. However, to your point, it needs to be carefully planned out. It sounds like you had a contingency plan in place which ended up being great. I do, however, encourage you to not give up on technology in the future due to this bad experience with one vendor. Mobile bidding offers so many benefits over paper that I believe its worth the effort to use it. Hopefully you all consider using technology again in the future. Congrats on all of your efforts and best of luck. Thanks for stopping by the blog, Jeff. A Florida client had a similar experience as Lou Ann. On the plus side, they switched vendors the following year and enjoyed a positive experience. Beyond the mechanics of the technology, it’s also about cost. If a silent auction has been well tweaked, it’s hard — at past investment rates — to get the wireless system to pay for itself, much less raise more money for the nonprofit. But with prices falling, more affordable systems will make the technology usable. I totally agree with that. As an auction insider, my observation has been that those galas which have had gains using the technology in the D.C. area had not historically invested in their auction. So by the time they tried wireless technology — no surprise — they had a gain. Anything would have made their auction better at that point, but it just happened to be wireless technology. As with anything, the sloppier a group has been in their past approach, the more gains they’ll see when they start to apply a new idea. It’s a matter of who / what gets to them first. No doubt with the technology available, properly planned these auctions could be very successful. Good luck and I am anxious to see a great ending to this! Technology can be wonderful when it works, but miserable when it doesn’t. Thanks for keeping us up-to-date with the latest stuff Sherry!